Peter Squires, Professor of Criminology and Public Policy at the University of Brighton, considers the research on police and guns, and calls for more psychological enquiry. Earlier this month, five Dallas police officers were shot dead by a black activist angered by the grossly disproportionate death toll of African American men following police encounters. Adding still further tension to any and every police/black street encounter, ratcheting-up police officer threat assessments every time they confront a young black suspect, is hardly what is required. Instead, calm heads, clear thinking, effective communication, the sensitive application of training principles, minimum use of force, and public accountability, would seem like the bare minimum. Unfortunately, when split-second decision-making is called for in a fast-moving and potentially dangerous situation, these ideals may be hard to come by – especially when overlain by fear, uncertainty, suspicion and, yes, the baggage of racist working assumptions sometimes conflated with an idea of ‘racial profiling’. The issues raised resonate in recent British debates about police use, and mis-use, of force. British Police firearms instructors I’ve interviewed have referred to the need for officers to develop ‘muscle trained’ reactions. Facing immediate threats, their training routines should kick in and they, almost instinctively, do the right thing – legally, procedurally, mechanically, effectively – to ‘neutralise’ (interesting word, that) any threat. Yet, even as the Dallas police deployed a weaponised robot against the sniper, police officers are not robots. Instead cultivating professionalism and ethical integrity is seen to be the key. A lot hangs on that phrase ‘almost instinctively’. Whereas those of a psychological orientation might want to unravel the distinct ‘learned’, ‘trained’, ‘perceived’, ‘co-produced’ and ‘situationally determined’ factors – which, vying with adrenaline-rushed, fight or flight responses, influence police action and decisions – sociologists like me have tended to look elsewhere. The notion of ‘police culture’ looms large in sociological studies of policing. It has its advocates and critics (Waddington, 1999; Loftus, 2009), but is often invoked to explain the non-correspondence between policing practice and policing theory (law, training, ethics, professionalism, etc.). This issue has arisen in many Independent Police Complaints Commission investigations. The IPCC operates according to what it calls a ‘learning from mistakes’ philosophy, but it sometimes appears as if the causes of the original ‘mistake’ are insufficiently well understood. The argument goes beyond relatively crude contrasts between so-called ‘rotten apples’ and ‘rotten orchards’ and picks up on the ways in which organisational routines, institutional practices, customs and procedures – the operational habitus of daily policing – are shaped by certain non-official values and traits such as ‘group loyalty’ (the infamous thin blue line: Westmarland, 2001), an action-oriented sense of mission, masculinity, suspicion (accompanied by often derogatory stereotypes of major ‘client’ groups (youth, street populations, ethnic minority groups) (Fassin, 2013), ‘black’ humour, and residual elements of sexism and racism. 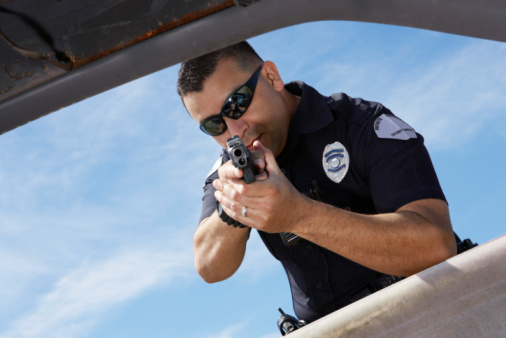 When these behavioural traits are factored into the police tactics and use of force, the evidence, unsurprisingly, suggests that, just as they deploy legal powers (such as vehicle checks, stop and frisk), they may also use non-legal powers such as ‘DWB’ or ‘driving while black’, a form of racial profiling relating to US vehicle checks; the ‘attitude test’, a judgement reached by British police officers concerning whether a suspect was suitably compliant and deferential, where failing the test could result in an arrest for ‘obstruction’; and the ‘Ways and Means Act’, a non-existent piece of legislation cited by UK officers to legitimise their actions vis a vis some unsuspecting petty offenders. Another central issue is that officers often deploy the equipment they have to achieve the purposes they seek. Other issues enter the frame of reference, especially, for instance, officer safety, but the message is generally that police will deploy the equipment they are given. Use of CS sprays increased dramatically following their introduction, arrestees sometimes being given a little spray once handcuffed (and contrary to regulations) as a de facto field punishment for non-compliance during the arrest; Taser use, likewise increased 45 per cent during 2011, when they were deployed to more UK police forces (Carter, The Guardian, 2012). And the same goes for guns. One of the most dramatic demonstrations of cultural differences in policing dictated by whether the police force in question was routinely armed is demonstrated in two articles (Knutsson & Strype, 2003; Hendy, 2014) exploring differences between the Norwegian and Swedish police (the latter routinely armed, the former, not so). Evidence showed that the Swedish police routinely approached crime incidents with guns drawn, challenged and confronted suspects with drawn weapons and, perhaps as a result, fired weapons five to six times more frequently. The message was pretty clear; weapons exerted a powerful influence upon officers, upon how police officers approached suspects, how they managed incidents and, ultimately how they ‘performed’ their roles as police officers. Beyond these stark differences in approach, a wide range of psychological research (both experimental and situational) summarised in my book (Squires & Kennison, 2010, Shooting to Kill? pp. 90-91) adds another layer of findings to the mix: police officers briefed about the ‘dangerousness’ of the suspect being sought, were more likely to shoot; officers who had to race to get to the scene (perhaps already adrenaline charged) were more likely to shoot; officers able to contain a suspect (for instance, in a building) were less likely to shoot; officers who had drunk large amounts of coffee were rather more likely to shoot, and officers witnessing a weapon were more likely to shoot. White officers were also more likely to shoot black suspects; officers who heard gunfire were more likely to open fire themselves (‘contagious gunfire’). Not all of these findings lend themselves to easy policy responses, though they do underpin the idea that violent policing responses are the product of many potential influences, contexts and narratives, and not just street-level encounters. Eradicating unnecessary violence from policing encounters must be as far-reaching. There is enormous scope for further psychological enquiry here. All of which may bring us back to Police and African American confrontations in the USA in the wake of the #BlackLivesMatter protests. While most US police officers will work their entire careers without firing their weapons, gun driven street encounters have become increasingly fraught. They are overlain by a climate of fear and mutual mistrust, allegations of racism and alleged impunity when sensitive triggers are too easily pulled and few legal consequences follow. Discussing the earlier Jim Crow era when justice and race relations fell markedly out of step with US law and the Constitution, US historian Kevin Boyle writes of how racist violence was part of a way of life in the South: ‘whites learned to have hair-trigger tempers’ to keep blacks in their supposed place (Boyle, 2004, p.65). A scenario, surely, to be avoided, but under ‘concealed-carry’ and so-called Castle-Doctrine laws, many states have delegated the right to kill even to private citizens. At least police officers are trained and, as noted already, it is in training, careful briefing, more effective communication, incident de-escalation management, and community centred and accountable policing that solutions will need to be found (as a recent Chicago Police Accountability Taskforce has argued). After all, the so called ‘fleeing felon’ laws which, in the US South, had seen a huge disproportion in the numbers of black men shot in the back while apparently fleeing the police, were gradually abolished in the late 60s and 70s and police departments were required to bring the practices of their officers back within the law. - Professor Peter Squires is at the University of Brighton. Boyle, K., 2004 Arc of Justice: A saga of race, civil rights, and murder in the Jazz Age. Macmillan. Carter, H. 2012 Campaigners raise concerns over increased police Taser use. The Guardian, October 21st. Hendy, R., 2014. Routinely armed and unarmed police: what can the Scandinavian experience teach us?. Policing, 8(2), pp.183-192. Knutsson, J. and Strype, J., 2003. Research note police use of firearms in Norway and Sweden: the significance of gun. Policing and Society, 13(4), pp.429-439. Loftus, B., 2009. Police culture in a changing world. Oxford University Press. Waddington, P.A., 1999. Police (canteen) sub-culture. An appreciation. British journal of criminology, 39(2), pp.287-309. Westmarland, L., 2001. Blowing the whistle on police violence. Gender, ethnography and ethics. British Journal of Criminology, 41(3), pp.523-535. Editor's note: My original intention was to have Professor Squires in conversation with a psychologist, but although I'm hopeful of a couple of responses in a later edition I have found it hard to source such a discussion. I know there is research out there - see the excellent summaries by BuzzFeed journalist Peter Aldhous - so I would be very grateful if any psychologists researching police armed response could get in touch with me on [email protected]. For more on the gun industry in the US, see Albert Bandura's exclusive book extract.